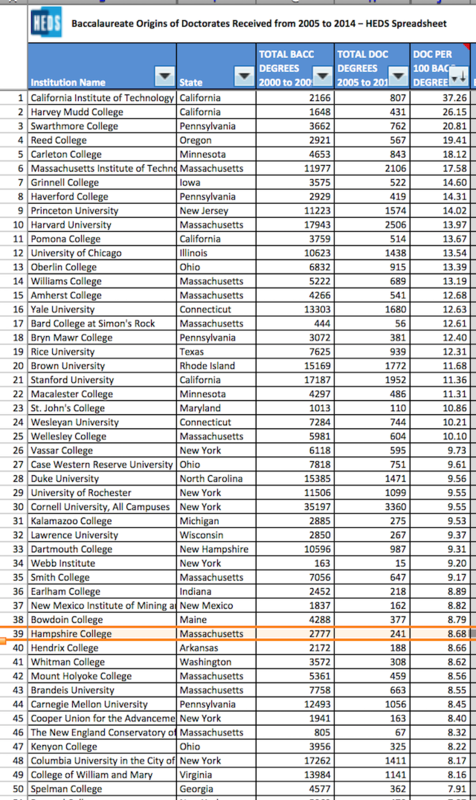 Federal data on US colleges and universities rank Hampshire College #39 nationwide by percentage of graduates who advance to earn a doctorate, close on the list to Dartmouth, Smith, Mount Holyoke, Carnegie Mellon, and Columbia. The result is notable from a college whose students design their own academic programs with faculty advisers and receive written evaluations instead of grades. Hampshire moved up one place; it placed #40 in the two previous years of the report. The SED is an annual census of all individuals receiving a research doctorate , i.e., PhD, ScD, EdD, from an accredited US institution. In addition to NSF, the survey is sponsored by five federal agencies: the National Institutes of Health, U.S. Department of Education, U.S. Department of Agriculture, National Endowment for the Humanities, and National Aeronautics and Space Administration. For more information visit http://www.nsf.gov/statistics/srvydoctorates/. Hampshire was founded by its four partner consortium schools in western Massachusetts — Amherst, Mount Holyoke, and Smith Colleges and UMass Amherst — to depart from a traditional liberal arts education. The college’s unique approach holds that students learn best when given the independence to direct their own learning, under the close advisement of faculty. Hampshire doesn’t restrict students to a major or a menu of required courses; it was founded to replace passive lectures as the primary method of education. Learning through experience, Hampshire students design individual academic programs from a range of learning activities and environments, such as project-based and discussion-based courses and seminars, independent studies, internships, community engagement, social action, labs, research and teaching assistantships, tutoring, apprenticeships, and field studies. Hampshire and its founding institutions comprise the Five Colleges, one of the nation’s oldest educational consortia. A student enrolled in any of the colleges may register, at no additional cost, for any of thousands of courses offered at the other schools and utilize the resources of the equivalent of a large university system, spanning not only classes but also events, clubs, sports, recreational programs, and a library system of nine million volumes. Division III, creation and advanced study. In Division I, students complete courses and learning activities in four of five broad topic areas. In Division II, encompassing their second and third years, they sets goals for their learning and explore their academic concentration. Each student assembles an advising faculty committee and completes an array of learning activities over four semesters. In their fourth year, Division III, students lead and complete an independent, yearlong, advanced study project, demonstrating before their faculty committee the ability to handle complex questions, concepts, and skills in their area of concentration. Commonly resulting in an original thesis or capstone project, the goal is for students to be active scholars able to pose and answer critical questions and solve significant problems. Hampshire is committed to education as a vehicle for positive change in the world, and all students are required to incorporate multiple cultural perspectives into their studies and perform significant community-engaged work, customized to their concentration. Hampshire students receive written, narrative assessments from professors for every course, as well as retrospective evaluations at the end of the three divisions. Students are required to reflect on their learning using self-assessments, which professors incorporate into their evaluations, resulting in instructive, constructive conversations between students and professors. Hampshire has no academic majors or departments, so students are not restricted to a department; they work among five interdisciplinary Schools, the offerings of the Five Colleges, and on off-campus projects. A student may combine multiple areas of interest in unique and uncharted ways, exploring and innovating across disciplines. In addition to the SED ranking, Hampshire’s success can be measured by the mainstreaming of many of its innovations in education, such as self-designed majors. Success is also demonstrated by the achievements of its alums: winners of Academy Awards, Emmy Awards, Grammy Awards, Peabody Awards, Pulitzers, Fulbrights, MacArthur Foundation “genius grants,” and Hillman Prizes; and renowned authors, scientists, producers, inventors, and historians. A quarter of its alums have started their own business or organization, placing the college at #6 on Forbes’s 2015 short list of most entrepreneurial colleges in the nation. As undergraduates, one in five who complete a Division III thesis in science is invited to present their research at a peer-reviewed conference, and 5 percent are lead authors on published, peer-reviewed journal articles, a remarkable accomplishment for undergraduates. Fifteen Fulbright Scholarships in the past six years places Hampshire among the nation’s most prestigious schools for these awards. Two-thirds of graduates earn an advanced degree within ten years of commencement. Table Source: The National Science Foundation’s WebCASPAR database and compiled by the Higher Education Data Sharing Consortium, HEDS.